Warrant Officer Michael Woodrow Hunter was born on January 23, 1944 in Durham, North Carolina to Mr. and Mrs. Woodrow W. Hunter of Ann Arbor, Michigan. 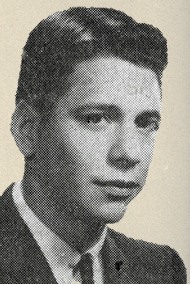 Michael is a 1962 graduate of Ann Arbor High School. He also attended Western Michigan University. Warrant Officer Hunter entered the Army in 1967 going through Basic Training at Fort Benning, Georgia. He was trained as a paratrooper and a helicopter pilot. Michael received his Wings as an Army Aviator in April of 1968 graduating tenth in his class. He began his tour of duty in Phuoc Long Province, South Vietnam on July 14, 1969 serving as a helicopter co-pilot on an AH-1G with C Troop, First Squadron, Ninth Cavalry, First Air Cavalry Division. Michael was killed on January 28, 1970 when the helicopter he was co-piloting was struck by enemy anti-aircraft fire during a gun run. The aircraft was struck by a 50 cal. round causing the main rotor to separate. He received the Silver Star, Purple Heart and Air Medal. Michael Woodrow Hunter is survived by his parents, two sisters, and his son. He lived 26 years and 5 days. He is resting in the Swedish Mission Cemetery located in Centerville Township, Leelanau County, Michigan. Michael's name is listed on the Vietnam Memorial in Ypsilanti Township under Ann Arbor. His name also appears on the Vietnam Memorial in Washington, DC on Panel 14W Line 075.